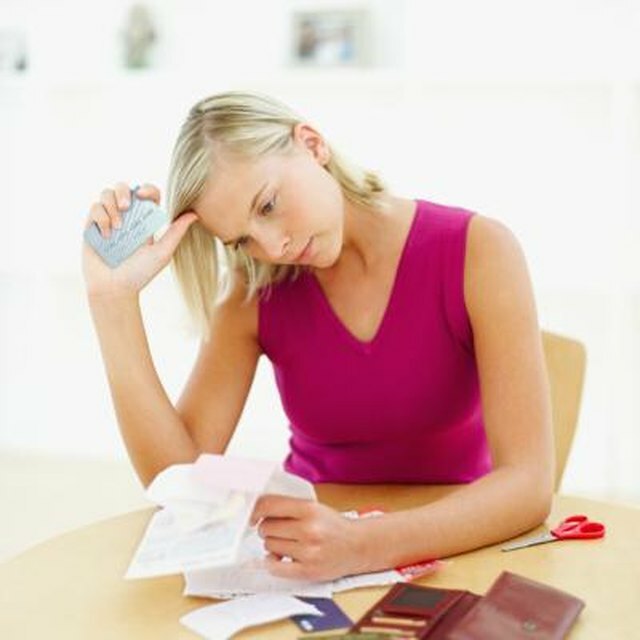 Credit card debt doesn't just require that you budget extra money to pay your debt each month. It can also alter your credit score, making it more difficult to access the credit you might need to buy a house or car or to cover emergencies with a credit card. Negotiating for a lower payment, debt settlement or lower interest rate can help you get out of debt more quickly, but it may also affect your credit score. When you attempt to negotiate your credit card debt, contact the number listed on your most recent bill or collection notice. The mere act of negotiation won't affect your credit score unless you're seeking a loan to pay down the bill -- it's the agreement upon a settlement or payment arrangement that has the potential to damage your credit. Many credit card companies report debt settlement to credit bureaus, and if you request a reduced monthly payment, this can also be reported, adversely affecting your credit. Ask the company how the new agreement will be reported on your credit report and get the answer in writing. A debt settlement is an agreement to pay a sum that is less than your entire balance in return for eliminating the debt. The sum is usually a set percentage of your debt determined by the credit card company, according to the book "Credit Cards and the Law." For example, you might settle your debt of $3,000 for $2,500. While some credit card companies will allow borrowers to settle their debts, debt settlement is most common among collection companies. If your debt has been handed over to a collection agency, odds are good that your credit has already been harmed. While debt settlement will be noted on your credit report and will have a negative impact, if you've missed a number of payments, a settlement could actually improve your credit after a few months. You may be able to negotiate with a credit card company for a lower interest rate, a move that will not harm your credit rating. Negotiation can be a powerful tool that lowers your payments if the company wants to keep you as a customer. Credit card companies generally want to keep their cardholders so that they can continue to profit from interest payments, so contacting the company and threatening to switch to another provider may give you some leverage -- but it's no guarantee of effectiveness. You may also be able to temporarily request lower payments through programs with your credit card company for borrowers having financial problems. You'll need to check the terms of your agreement and ask the company how it will report the payments to the credit reporting bureaus to see if this will affect your credit. Can a Collection Agency Take a Person to Court? When you make a payment on a debt, this can reset the statute of limitations as well as the permissible credit reporting period. For most types of debt, items fall off of your credit report after seven years. However, making a payment toward the debt can reset this time period. If you make a payment close to the end of the reporting period, you could actually harm your credit because you've stopped a negative item from falling off at the end of the seven-year period. Similarly, payments toward debt can also reset the statute of limitations -- the time period during which a credit card company can sue you (the time varies from state to state). A judgment in a lawsuit is a negative item on your credit report, so extending this statute by making a payment can harm your credit. If you're nearing the end of the statute of limitations or reporting period, you may want to consult an attorney or financial adviser, who can help you determine how negotiating to make a payment or settlement might affect your credit.